Over the last week or so we had been enjoying a little bit of a heat wave (back to rain today) with some gloriously hot sunny days – and it has been great practice for France. After the anxious experience we had on the beach a few weeks ago (see previous blog post) I was a little unnerved as to how Lucia would cope in the heat and how we could handle it in the best possible way. But I am pleased to say she has been wonderful! Our main dilemma has obviously been the compression tights – can we take them off for short periods to give her a breather or would that be to the detriment of her swelling? Of course, by removing the tights we are also opening her up to more of a risk of scrapes, cuts or bites as well so it is a big decision to make – especially when you overthink things in the detail that I do! Advice from Lynne, our physio, was to try them off for short periods of time in the heat and monitor the effects. So we got very brave and decided to try this little experiment as on the first of the really warm days Lucia had a hard time coping. My parents were looking after her and were doing an amazing job of keeping her as cool as possible with cold face cloths and staying indoors. However, she just wanted her tights off and was in grumpy form. Knowing how warm I had felt in my office all day wearing a cool dress I could only imagine how hot and uncomfortable my poor baby must have felt. 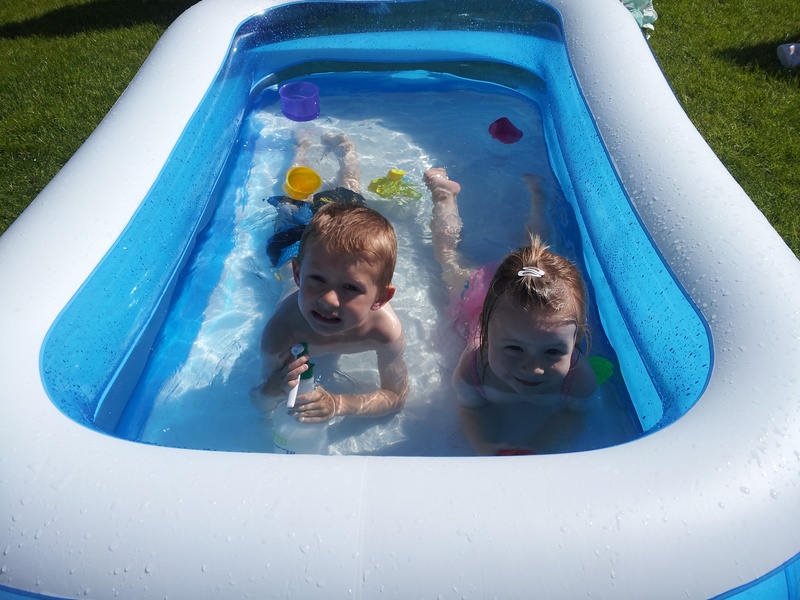 The third day I was at home and filled up the paddling pool to allow both Max and Lucia to keep cool in the sun. It was also a bit of a compromise for me as at least I knew that when her tights were off she was still able to have the natural compression that water gives her. That day Lucia wore her tights for a couple of hours in the morning, then I took them off for an hour in the pool, put them back on for four hours in the afternoon and then took them off for the day about 4pm. I have to say my nerves were on edge when she had them off as I watched for signs of extra swelling or cuts but after a little while I was able to relax and enjoy watching her playing with Max in their swimming costumes – and not a compression garment in sight. It was so ‘normal’ and I loved it and she loved it. Wonderfully, there has been no ill-effects so I think we now know she can manage short periods without the tights as long as we are vigilant. Crucially, she was still in her garments for the majority of each day so she was still gaining plenty of compression benefits as well as managing a little free time. Obviously this would never be a daily thing as it is so important that Lucia knows she has to wear her tights regularly, everyday, for the rest of her life. If we started to take them off too much we would risk all the good work we have been doing since she was five months old to maintain her condition as well as teaching her bad habits. However, I am beginning to think that as long as they are on 99% of the time that we can allow that 1% every now and again when needs be. I feel a little more prepared for France now and a little bit more flexible with everything which is a big step – and now more excited to get on our holidays! Lovely to see her in the little pool… Yes it is a great feeling to get those stockings off even as an adult! !